You are here: Home / News / BC Lions Fan Tailgate Parties are back! BC Lions Fan Tailgate Parties are back! Well, after a stressful couple of weeks wondering if many of us had attended our last BC Lions tailgate party, I am pleased to announce that a deal has been reached with the City of Vancouver, as well as the Easy Park group. First things first I have send a huge than-you to Vancouver City Councillor Andrea Reimer. She spearheaded this with the Easy Park representatives and without her we wouldn’t be making this announcement today. I also want to thank Greg Watrych and Mel McKinney and the folks at Easy Park for giving us this opportunity to continue this great pastime we all love. The Lot we will be using is located on the north east corner of Quebec and Terminal. 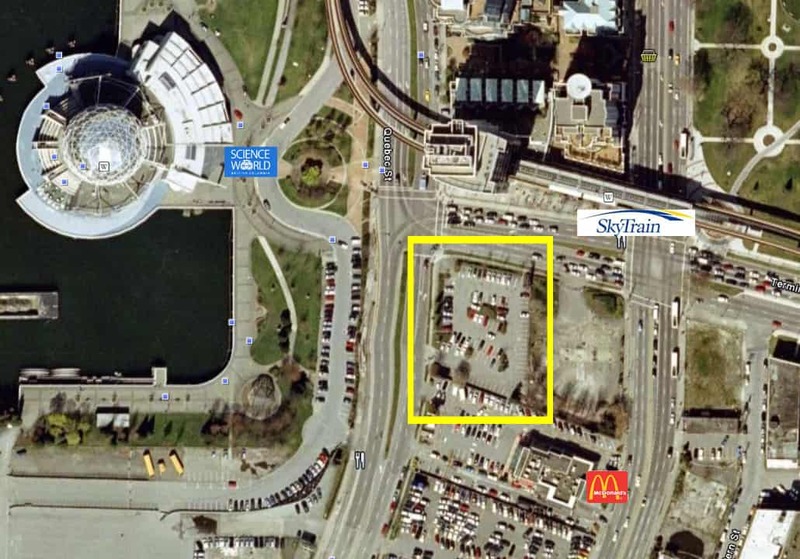 It is across from the skytrain station, and beside McDonalds (Image below) and there are some rules we MUST abide by should this be allowed to continue. All cars in the tailgate lot must use one spot and must pay for that spot by purchasing a ticket from the meter in the lot. DO NOT buy tickets from street people. Parking stalls are available on a first come, first serve basis. All garbage must be bagged and secured in vehicles prior to departure for the game, and must be taken home with you to dispose of. Bring extra garbage bags. There are no exceptions to this rule. All barbecues must be attended at all times, and a fire extinguisher must be present at the tailgate. If you have one, bring one. NO CHARCOAL BARBECUES ARE PERMITTED. There shall be no “public” bathroom use of any kind. All tailgaters must find an appropriate washroom to use. I’ll be at the lot early on Friday to begin setup. I’ll have extra supplies on hand for those tailgating newbies, but if you can bring the usual, cups, garbage bags and be prepared to take your garbage with you, that will be great. I look forward to seeing the regulars and maybe a few newcomers. Come on out and join us and ROAR YOU LIONS ROAR! I’ll also have CFL Fans Fight Cancer shirts for sale if you would like to support that cause!